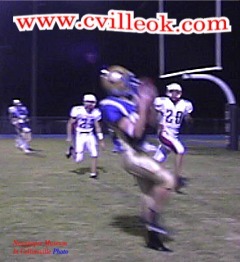 The Collinsville Cards were shutout by 4A's #2 ranked Oologah Mustangs, Friday at Oologah's Homecoming. 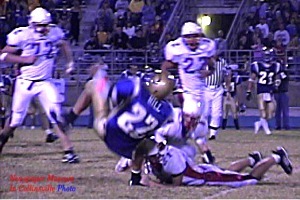 ...But the Cardinals did get in their hits ... as shown in this Justin Scott knockdown in the second half. The Cards' record drops to 1 win and 4 losses. Wagnor travels to Sallee Field next Friday while the band travels to St. Louis for the Band of America marching competition. Cheyanne Keith (escorted by Jeff Bradshaw) was Oologah's sophomore attendant. She is the daughter of Kelly and Reggie Keith. Kelly is a former C.H.S. sports standout. Grandparents are Raymond and Willa Keith of Collinsville. 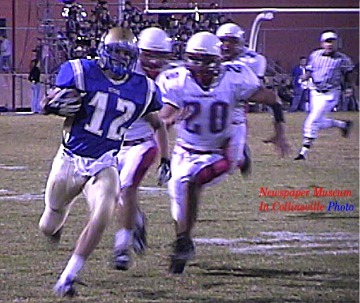 Oologah established the tone early as they ran this 48 yard option play into the endzone on their first possession. The play was called by an illegal block. The next play was a 41 yard option run to Collinsville's 8 yard line. The Cardinal defense stepped up and held Oologah to a field goal for a 0-3 lead at 5:27 in the first quarter. This 12 yard TD pass gave Oologah a 0-9 lead with 19 seconds left in the 1st quarter.